Pictured left to right: Rich Danek, Leo Effling and Eric Kneen. 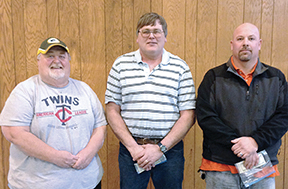 The Dave Olson Texas Hold ‘em Poker Tournament, hosted by the Artesian Fire Department, was held recently with 57 players taking part. The final table consisted of James Massenstache, Art Kneen, Eric Kneen, Chris Roth, Kyle Roth, Greg Edwards, Bob Schmit, Rich Danek, Rick “Disco Rick” Prussing and Leo Effling. Kneen won first, Efflng second and Danek took third. Danek also had the high hand of the night with four sevens. Cast members are, back row: Jack Davis, Chelsea Wenzel, Anita Fouberg, Jason Bruce, Paula Linke, Kathy Peterson, Carrie Howard, Tom Fouberg; front row: Joe Davis, Craig Lieber, Carie Fry, Brett Kroeger, Erica Howard, Gayle Feistner and Tara Weber. March 26 and 27 Woonsocket Community Theatre will be performing a dinner theatre play called “Everybody’s Crazy” by Jay Tobias. Dinner will be served on Thursday from 5:30–6:45 p.m. with the play beginning at 7 p.m. Friday will be play only at 7 p.m. The remainder of the tickets will be available at the door on the night of the performance or a $7 ticket, available at the door, for the play only. Dinner is served by the Woonsocket Post Prom. All activities will take place at the Woonsocket School Gym. The program is directed by Bernie Davis. “Everybody’s Crazy” is a comedy with three young college men who take on more than they can handle when they buy a summer hotel. Business is bad. So very bad that it becomes necessary to give the hotel a reputation as a haven for ghosts and the secret hiding place of an old miser’s hoard of gold. That brings in the guests – though perhaps not the kind the young men are looking for: an elderly spiritualist, a sleep-walking Romeo and his hypochondriac wife and a farmer prone to nightmares. One of the boys impersonates a doctor and treats the guests for all sorts of imagined ailments, another assumes a feminine disguise and sets many a masculine heart beating! The Swenson melon farm and St. Wilfrid Catholic Church, Woonsocket, will be the host locations for the 125th events honoring the role of farming, ranching and agriculture on Saturday, June 27. This family friendly day will include farm tours and presentations, a petting zoo, a blessing of land, animals and machinery, Mass and a meal. This is one in an ongoing series of events which began last fall and will culminate Aug. 14-16 with a large diocesan event in Sioux Falls. The Catholic Diocese of Sioux Falls was established in 1889 and is celebrating its 125th anniversary, and particularly in this gathering is recognizing the role agriculture has and continues to play in the lives of so many Catholics. “People of faith will be joining together to celebrate their legacy, both what they inherited from those who shaped the faith on the prairie and what they will be leaving to generations yet to come,” said Bishop Paul J. Swain, who will celebrate the Mass. The Swenson farm is located on the south edge of Woonsocket – 23020 397th Ave.
As one of the 125th events being held around eastern South Dakota, this one will also recognize the people of the central portion of the diocese. “We will pay tribute to the pioneers who nurtured and nourished the land, and the farmers and ranchers who continue to do so today,” said Jan Feterl, director of Special Events for the diocese who has worked with a dedicated local committee on details for the day. History boards will be on display to provide a glimpse of all the parishes that have made up the central part the diocese over the past 125 years. “This summer Saturday afternoon will be a great time for families to connect or reconnect with the rural roots of our diocese,” Feterl said. Registration is requested to help plan for food. Visit www.sfcatholic.org/125thAnniversary/ for more details and to register. Or stop by your local parish to sign up. 6:30 p.m. – Meal/Tours of the Church. All guests will receive a commemorative prayer coin honoring the 125 years of faith. July 12 – St. Paul, Marty, honoring the Legacy of Faith through the Native American community. Sunday Mass, speakers and food. Aug. 14-16 – Sioux Falls – LEGACY – a diocesan gathering featuring nationally known speakers and musicians, great opportunities to pray together and great fun as well at the Sioux Falls Arena and Convention Center. Details on all events may be found at www.sfcatholic.org/125thAnniversary/.